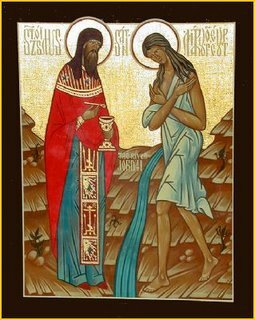 Novitiate Notes: Notes on the Sunday of St. Mary of Egypt. In the Byzantine tradition, the Fifth Sunday of Great Lent, celebrated today by most Byzantine Catholics and next Sunday by the Orthodox churches, is also known as the Sunday of St. Mary of Egypt. A fifth-century ascetic and hermit, Mary of Egypt is commended to the faithful on this Lenten Sunday as a model of penitence and spiritual conversion. Mary's story is recounted in great detail in a classic account by St. Sophronius of Jerusalem and has often been retold elsewhere, including in Jacobus de Voragine's Golden Legend, a widely-read compilation of saints' lives that deeply influenced St. Ignatius of Loyola, among many others. The numerous retellings of Mary's life vary in some details, but all share the same basic outline. At twelve, Mary ran away from home for a dissolute life on the streets of Alexandria. After a number of years, Mary began to feel stirrings of repentance and resolved to make a pilgrimage to the Holy Land. Lacking sufficient funds for the trip to Jerusalem, Mary paid her way through prostitution. At the Church of the Holy Sepulchre, Mary was so strengthened in her desire to repent for the sins of her past life that she vowed to spend her remaining years as a hermit in the Palestinian desert. For the next half-century, Mary lived in complete solitude and extreme privation, spending most of her time in prayer and contemplation. Discovered one day by Zosimas, a monk from a desert monastery, Mary recounted her life story and asked her visitor to bring her Holy Communion. Zosimas did so on Holy Thursday, giving rise to a scene often reproduced on icons like the one above. Returning to visit Mary the next year, Zosimas found that she had died. Zosimas told his fellow monks about Mary, and in time the story was written down and spread throughout the Christian world. I'm not quite sure where I first learned about Mary of Egypt. I believe her story was referenced in a work of classical literature I read in high school, but I forget exactly the book was that mentioned her. Later, I discovered her anew in the pages of the Golden Legend. Many of the details of Mary's story may strike modern believers as merely fanciful, and some will likely question whether she existed at all. Though I'll admit that I was initially attracted to Mary of Egypt by the exotic elements of her story, over time I've developed a sincere devotion to the saint. Mary's life reminds us that conversion is a lifelong process. Mary's resolve to repent for her sins didn't change her life overnight. As the disreputable means by which she paid for her pilgrimage show, Mary continued to sin even after she had begun her conversion. At the Holy Sepulchre, Mary made a firm commitment to live in a radically new way - and yet, in the solitude of the desert, she struggled with spiritual demons as great as any physical temptations she had faced before. Few of us will ever undergo as radical a process of conversion as Mary did, but in the struggles of this great ascetic all Christians can find inspiration to persevere in our efforts to live in the light of the Gospel. St. Mary of Egypt, pray for us. AMDG. Pope no longer "Patriarch of the West." There is no joy in Rockford . . .